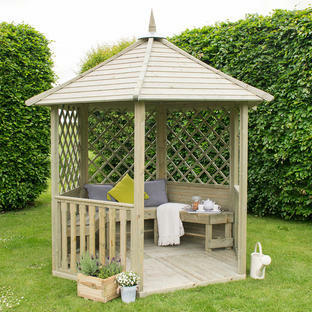 Delightful summer gazebo to sit and watch the sun go down. 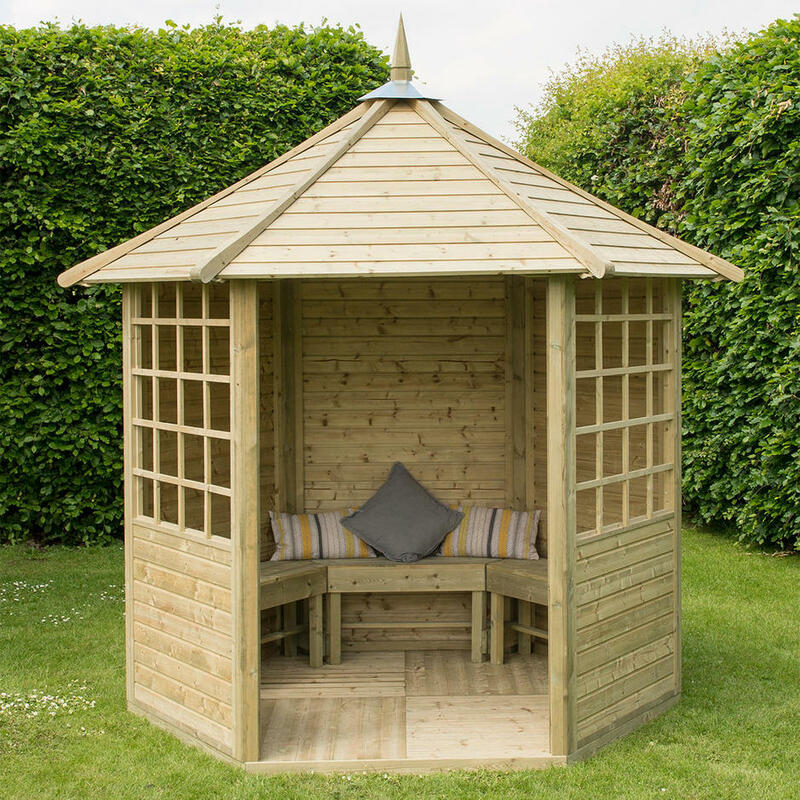 The Arden gazebo is perfect if your garden is in an exposed location, and you want somewhere to sit protected from the elements. 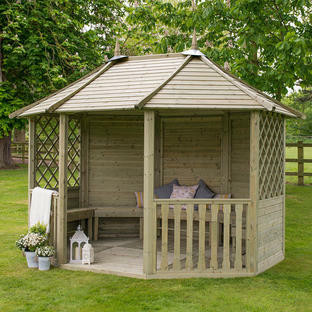 The gazebo has three solid back panels, which provide extra protection from the wind and rain, with 2 side panels with windows to enjoy the view. 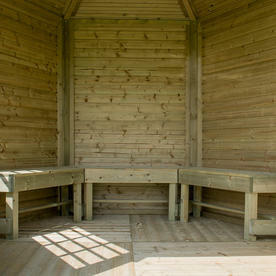 It comes with an integral timber floor and three benches (not pictured) - these can be left out if you need more space. The roof is a wooden tongue and groove, planed for a smooth finish. 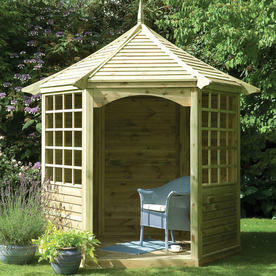 The footprint of the gazebo floor is 230 x 200cm. 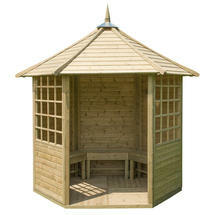 This gazebo has been pressure treated, and has a 15 year guarantee against rot, so no extra treatment is required. 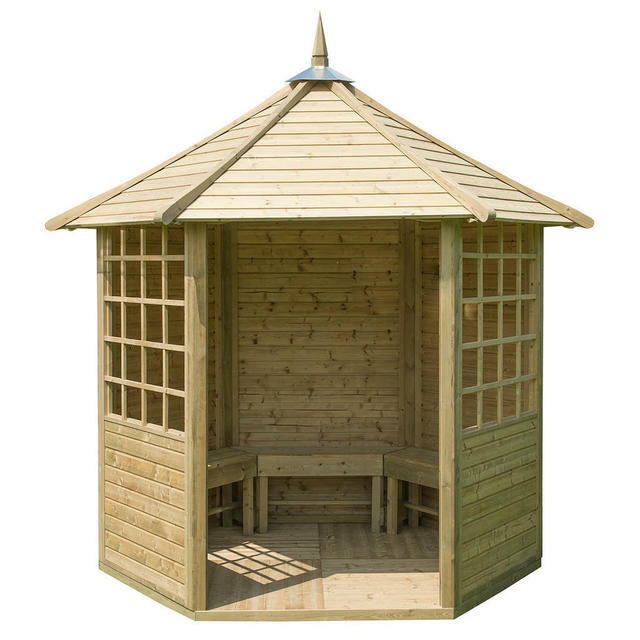 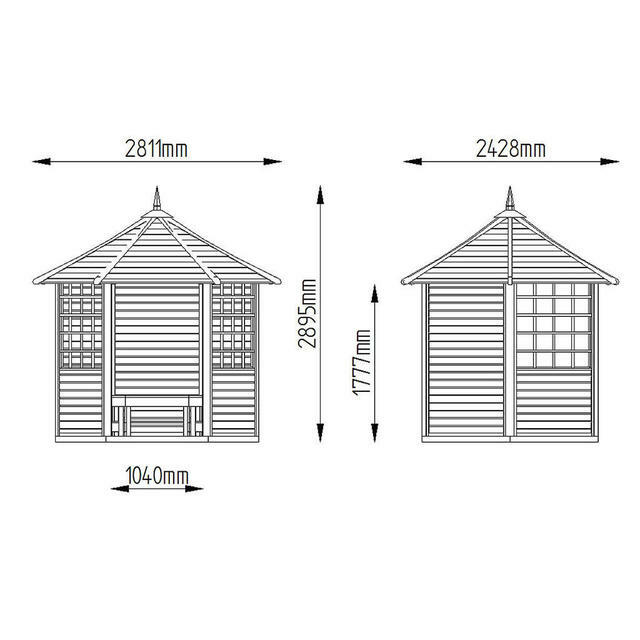 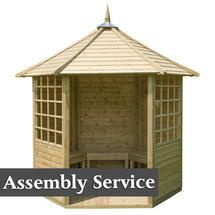 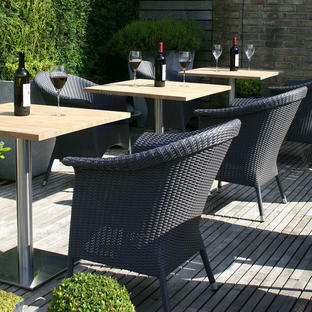 The Arden gazebos are supplied with comprehensive instructions and fixings, assembly will take approximately 8 hours. 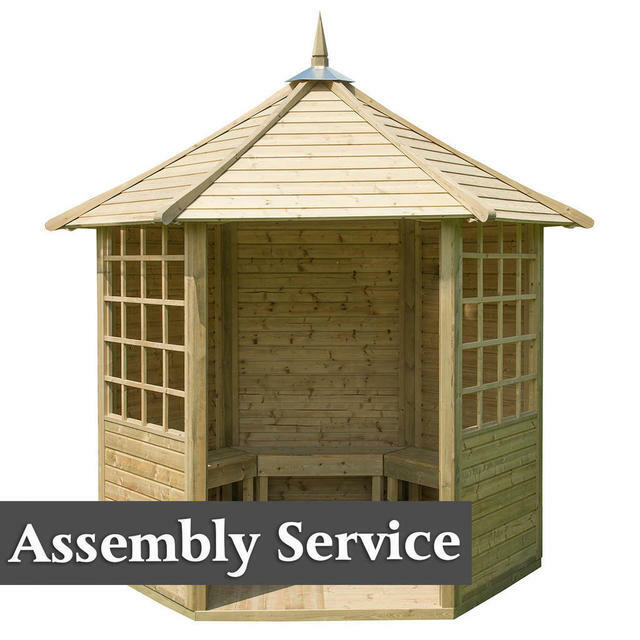 If assembly is required, the site needs to be flat, solid ground and made ready for assembly; please contact us for details. 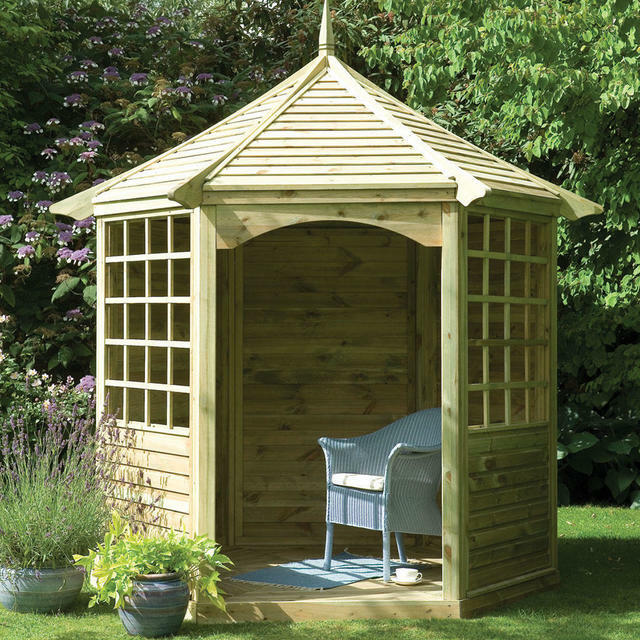 The gazebo has been pressure treated, and has a 15 year guarantee. 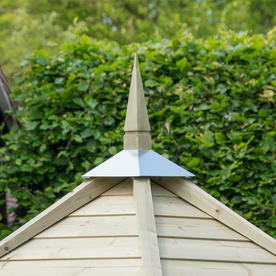 The colour will fade over time to a honey brown. However, if you wish to stain the structure in your own colours, this should be done immediately, following manufacturer's instructions. 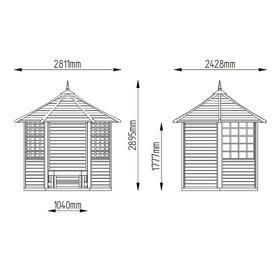 Please note; we are unable to offer delivery of this item to addresses in the Scottish Highlands and Islands, Northern Ireland, Chanel Isles, Isle of Man, Scilly Isles and Isle of Wight and other areas outside UK mainland.